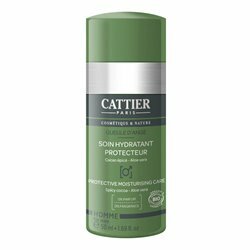 Cattier Day care Moisturizer Elixir Vegetal 50ml in our pharmacy bio, Comment on advice for use and dosage with our partner Avis checked after your purchase. A day care that restores the moisture of normal skin and retains the radiance of the complexion . Rich in vitamins, for a soft and supple skin. Cattier Moisturizing Day Care Elixir Vegetal 50ml is a true care of the normal skin . This moisturizing treatment, with a creamy and light texture , is perfect for softening and protecting normal skin everyday. It preserves the skin's natural moisture and provides it with the essential vitamins and fatty acids necessary for its beauty. Enriched with organic coconut butter with nourishing properties, it moisturizes intensely. Organic jojoba extract forms a non-greasy protective film that regulates the production of sebum and preserves the natural hydration of the epidermis. Organic pumpkin seed oil is full of vitamins, essential fatty acids and minerals. Slowly press the pump to deliver the optimal dose of care, then penetrate the entire face, neck and décolleté. Apply daily to clean, dry skin for supple, soft and perfectly hydrated skin. 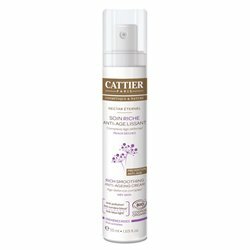 Comment on advice for use and dosage of Cattier Day Care Moisturizer Elixir Vegetal 50ml with our partner Avis checked after your purchase. Aqua, Glycerin, Caprylic / Capric Triglyceride, Centaurea Cyanus Flower Water *, Sorbitan Stearate, Squalane (Vegetable) Cocos Nucifera (Coconut) Oil *, Simmondsia Chinensis Seed Oil * Stearic Acid, Methyl Glucose Sesquistearate, Cucurbita Pepo (Pumpkin) Seed Oil * , Xanthan Gum, Silica, Benzyl Alcohol, Fragrance, Sodium Benzoate, Tocopherol, Lactic Acid, Limonene, Linalool, Citronellol. Cattier comes in the form of a 50 ml bottle. How to know if our skin needs hydration ? What's the point of hydrated skin ? Protection against external aggressions (environment, toxic product, injuries, various conditions). Assimilation of all care (dehydrated skin will have a much harder time absorbing care). Cell renewal (dead skin to eliminate, need the maturation of the stratum corneum, impossible without hydration). Day care is an essential beauty of the beauty routine. You must choose your cream according to the nature of your skin. In 1987, Daniel Aressy, cosmetologist pharmacist, specialized in natural cosmetology, took over management of the company and continues the founder of philosophy by developing products ever more efficient, using natural ingredients. Under his leadership, the company is moving towards the Natural and Organic Cosmetic and COSMEBIO joined the association. Since its inception, the Laboratory of Natural Cosmetology Cattier puts all its know-how and expertise at the service of beauty and well-being. 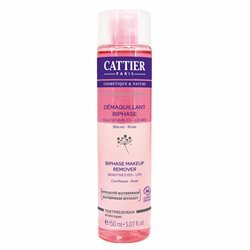 Environmentally friendly and eager to share with consumers the multiple benefits of nature without harming it, Cattier Laboratory has designed a range of beauty products, Hygiene and Care BIO, natural, nice, gentle and effective. 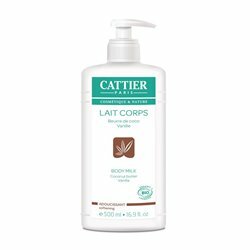 Cattier Organic cosmetics are formulated with natural ingredients partly from organic agriculture. They contain no parabens or phenoxyethanol, no coloring and synthetic fragrance, or any derivative petrochemical. Dry skin care: Dry, very dry, extra dry skin is by nature fragile and easily irritable. Too long dehydrated, more serious problems can settle. And it will tend to age faster! But scrupulously following these 5 essential rules, you should find a beautiful skin healthy and counter the problems inherent in dry skin.